CrococryptMirror is an encryption tool which mirrors complete folders to encrypted folders. The encryption algorithms that are used are AES and Twofish (256 bits, cascading). The keyfile is secured by a password using PKCS #5 (PBKDF2) with a SHA512/Whirlpool based HMAC using 100000 iterations and also AES and Twofish. Additionally, a ZIP compression for storage space optimization is used. For reasons of performance the synchronization of source and destination folder is done in the background. A backup copy of the keyfiles has to be stored at a secure place. Without the keyfile the containers cannot be decrypted. In the portable version of CrococryptMirror keyfile and settings are stored together with the application folder. Hence, the complete application can be transported on an external storage device. 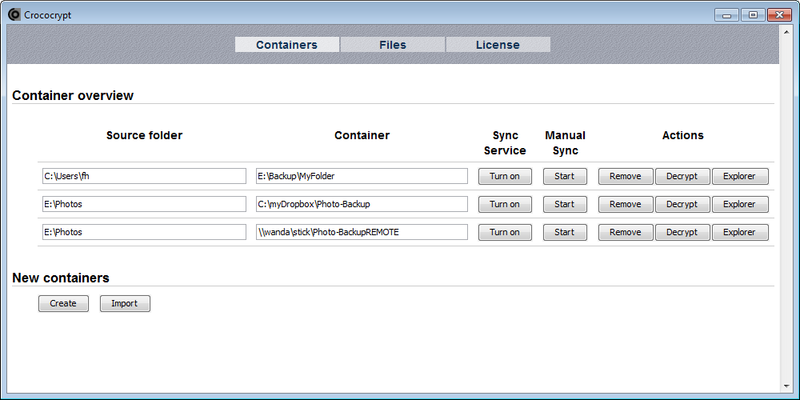 Moreover, the folder "container" can be used to store portable containers. Mirroring can be done manually (on-demand) or by using the sync service which detects directory changes on the fly. Features: Copying and synchronizing of files/folders/directories (recursive) to encrypted folders, Encryption of filenames, Source folders can be stored in multiple destination containers at the same time (e.g., USB disk drive and Cloud storage), Network drives can be used as sources and destinations, Explorer view to read encrypted containers. CrococryptMirror is a free software without registration, without activation, without limitations and without ads. Changes: Fix for Explorer View (WebDav) under Windows 10. For details go to the CrococryptMirror Homepage. License (English) This software is provided 'as-is', without any express or implied warranties or conditions of any kind. In no event will the author be held liable for any damages arising from the use of this software. Permission is granted to anyone to use this software for any purpose, subject to the following restriction: You may not distribute or redistribute this software without permission by the author.